Imprint Method: 4 Color Process - Make sure you get your promotions all squared away with this custom giveaway! 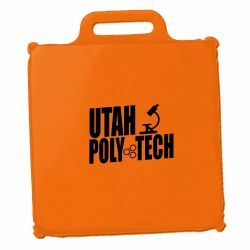 Made of soft vinyl, each square shaped 11 1/2 x 11 seat cushion measures 7/8 thick and features a convenient carry handle. An excellent giveaway for organizations, sports teams, and fundraisers, each cushion can be customized with an imprint of your choosing. Offered in several colors, the possibilities are endless! Proudly made in the USA and always in stock! Shipped bulk, compressed. To allow reinflation, remove sticker. Size: 11 " x 11.5 " x 0.88 "